The premium solution for processing of 20 and 200 liter containers. No more insufficient filling or unstable injection molding processes! 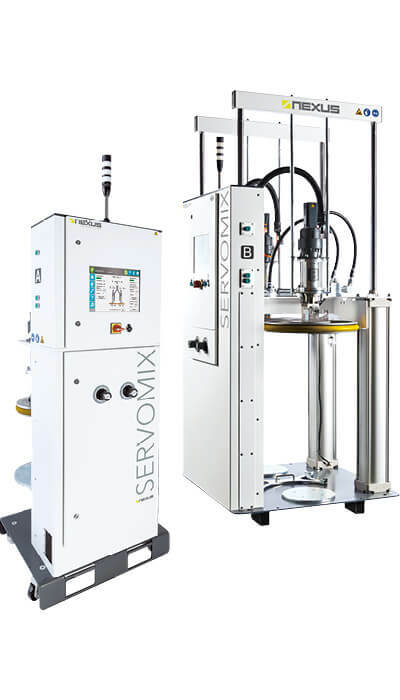 The new Splitnex technology, paired with highly efficient servo drives and a powerful control system, automatically separates and purges the air from the material before it is fed to the process. The maintenance-free pump technology ensures an accurate mix throughout the dosing process, no matter whether high dosing volumes with a conveying rate of up to 20 l/min or microdosages of less than 0.1 g are dosed. The innovative technology stabilizes the dosing process with high repeat accuracy – cycle after cycle. This results in a larger process window for your injection molding process. The user cannot make mistakes, as the machine software controls all relevant processes. In addition, automated drum venting with air detection permits drum changes within a few minutes. The venting procedure is performed and also checked automatically by the system. For control, monitoring, and data management, any browser-enabled device can be used. Also an integrated remote maintenance interface is available.